I love a Thai curry and whenever we go out to a Thai restaurant, I always look at those having a Massaman curry with envy knowing how high in points they are. To quell my craving for this Thai delight, I decided that this week I would try and adapt a low point version. 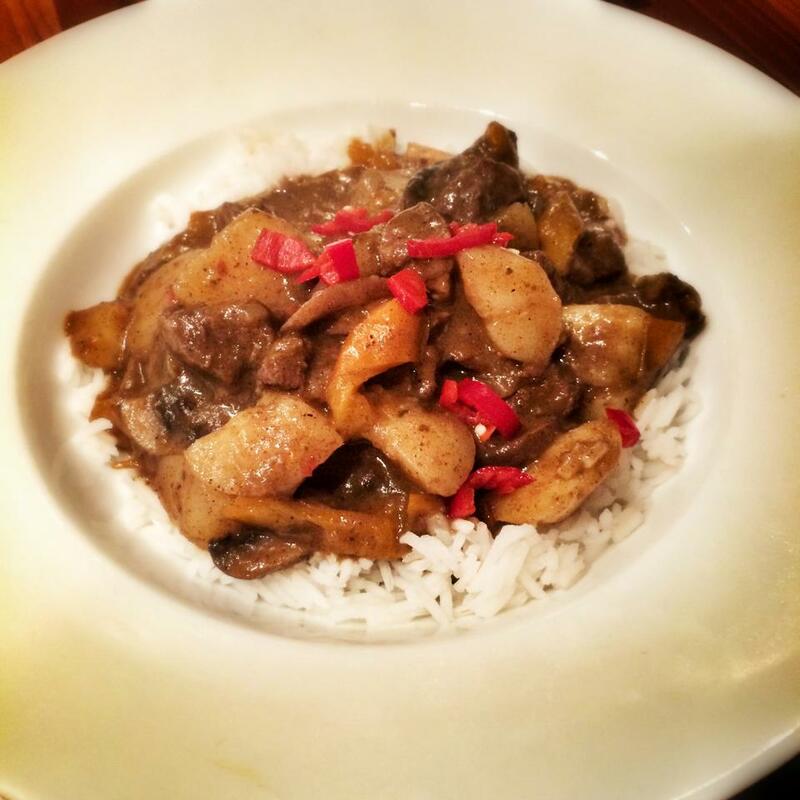 I researched different ingredients common in Massaman curry’s and ended up adapting this little beauty. It turned out beautifully and was only 10sp so paired with 40g of dry basmati rice per person. This made the whole meal only 14sp, bargain! I’ve included some instructions for making this curry with chicken too for those who aren’t the biggest beef fans. If you want to reduce the points even further you could omit the potatoes but I think they add a lovely additional texture and bulk to the dish. Next time I make this I’m also going to whack in a carrot or two! Pop the beef into a large pan (with a lid if you have it). Add the curry paste, mix in to coat the beef and fry the beef until it is brown and sealed on the outside (around 8-9 minutes depending on the heat of your cooker). Add the onions, peppers, mushrooms and potatoes, stir and let cook for a minute or two. Then pour in the tin of coconut milk and stir. Add the kaffir lime leaves (whole), cinnamon stick (whole), tamarind, brown sugar and fish sauce. If you like it extra spicy, at this point you could also had a sprinkle of crushed chillis (I do!). Bring the whole thing to a simmer then pop on the lid (or tin foil if you don’t have one) and pop in the oven for between 1.5 and 2 hours. I did mine for an hour and a half as I’m impatient! Check the curry after around an hour to make sure it’s not drying out too much. If it is add some water. The curry should think nicely in the oven. If you would like it thicker, take it out the oven once cooked, pop on the hob and add 1sp of cornflour mixed into a paste with water. Simmer for a few minutes. Finish the curry by stirring though the coriander and giving a good squeeze of lime. Garnish with the chopped chilli. Serve with 40g of basmati rice per person and a slice of lime on the side. p.s you could also make the curry with 400g of raw chicken breasy and it would make it slightly quicker to cook. If you fancy doing this it will be 9sp for the curry. When cooking add the chicken at the same point as I add the beef above but cook the chicken until it is cooked through. Then add the other vegetables and then everything else and simmer on the hob until the potatoes are cooked through (around half an hour). So pleased you enjoyed it Debs, this is one of my favs! Hi! This looks great. When are you supposed to add the mushrooms though? Another fabulous recipe – my husband is now saying we shouldn’t bother going out as nowhere produces food this good – all thanks to you Laura! This dish is very special !!! Ah what a lovely thing to say, so pleased you are enjoying my recipes and thank you for letting me know! Want to make this today – have everything set and then realised I didn’t order the beef! Going to make it with chicken but worried it’ll come out chewy cooked so long?